Description As of the newest version, the game sometimes doesn't close properly. Upon quitting, the game screen itself successfully manages to close, but the DF directory will still say it's in use if prompted (like moving the directory immediately after closing). This is followed by a crash. Also, the game music will sometimes play a few seconds after closing the game proper before a crash. Note that this doesn't seem to happen all the time, but rather randomly. I'm not sure if there's anything in particular that's done in-game to trigger the crash - but it's occurring on both my Window 7 machines. Additional Information Worth noting that this crash doesn't occur on the legacy version at all, so I'm guessing this has something to do with the new compiler/SDL issue that was mentioned in a devlog. Once I'm out and about on the laptop I'll see if the results are the same on it. Both are Windows 7, 32-bit though. Might snag a relative's Vista laptop to try it too, while I'm at it. That would be me, yes. Can at least remove it from Dropbox now. EDIT: Easily fixed via the link you provided in that issue. I can now confirm that THIS issue persists on my laptop as well. Here's some more weirdness. I thought previous that it consistently crashed, but the past few times on both desktop and laptop, it hasn't. Increasingly peculiar. Many thanks to NCommander and Quietust for figuring out the issue. 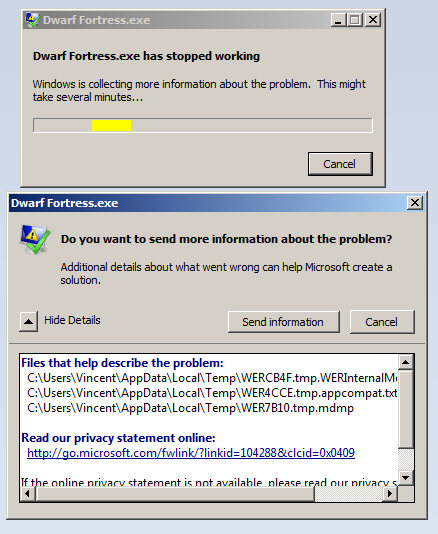 Do the recently-posted test versions at http://www.bay12games.com/dwarves/ [^] fix this? I'll mark it as fixed for 0.43.05, then. If the newest test versions don't work for anyone, it would be good to let Toady know in the 0.43.04 thread, or on whatever thread is open at http://www.bay12forums.com/smf/index.php?board=10.0, [^] since that's where a lot of discussion about MSVC 2015 and 64-bit issues has taken place. You should also PM me or other manager(s) on the forum too, to have this ticket reopened.